The Business Class® M2 line of trucks offers unparalleled benefits that help businesses increase productivity, performance and profitability. Available in 106- and 112-inch BBC platforms, the Business Class M2 supports a wide range of bodies and chassis-mounted equipment, making it the ideal solution for pickup and delivery, towing, food and beverage distribution, tanker and fire/ emergency applications. Vocational models are available for specialized jobs such as refuse, construction, utility and government/municipality. Increased efficiency leads to increased profits, so the Business Class M2 offers great fuel economy and easy maintenance for maximum productivity with minimum downtime. Adding to the value of ownership is Freightliner’s legendary customer support, a network of more than 400 dealers across North America and a 24-hour assistance hotline that will keep you operating at peak efficiency day in and day out. The Business Class M2 is more than just a vehicle. It’s a clear business advantage. The Business Class M2 106 is the true utility player of the family, offering the perfect platform for a variety of applications. Available as a truck or a tractor, it is extremely agile, featuring up to a 55-degree wheel cut, set-back front axle and swept-back bumper for excellent maneuverability in tight urban situations. With a GVWR of up to 60,000 pounds, this medium-duty vehicle supports a wide range of bodies and chassis-mounted equipment. It comes standard with a powerful yet fuel efficient Cummins® ISB or ISC engine, with horsepower ratings from 200-380 hp. It’s available with manual, automatic and automated transmissions from Eaton® Fuller® and Allison,® as well as Freightliner’s SmartShift® option that offers hands-on-thewheel shifting. For even greater efficiency, the M2 106 is available with a hybrid power system. Stylish and practical, the Business Class M2 106 features an aerodynamic sloped hood, low profile dash and an expansive 2,500 square-inch windshield that gives drivers unparalleled visibility. With a multiplex wiring system, clear frame rails and a variety of exhaust packages, you can get the configuration you need for the job at hand. 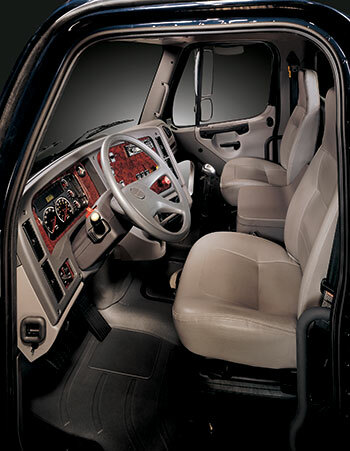 With a GVWR of up to 80,000 pounds, the Business Class M2 112 is the truck for the most demanding situations. It comes standard with a powerful Detroit Diesel DD13™ engine, with horsepower ratings from 350-450 hp and up to 1,650 ft.-lbs. of torque. Transmission options include manual, automatic and automated transmissions from Eaton Fuller and Allison, as well as Freightliner’s SmartShift option that offers hands-on-the-wheel shifting. The Business Class M2 112 has a lightweight aluminum cab that maximizes payload and resists corrosion. It’s available as a truck, tractor or truck with end-of-frame connectors. With optional spring or air suspensions— including Freightliner’s TufTrac® and AirLiner® rear suspensions rated up to 52,000 pounds—this truck delivers a smooth, even ride under the most demanding conditions. In fact, with frames of up to 3.7 million RBM and 1,500 square-inch radiators, the Business Class M2 112 can tackle the toughest jobs. 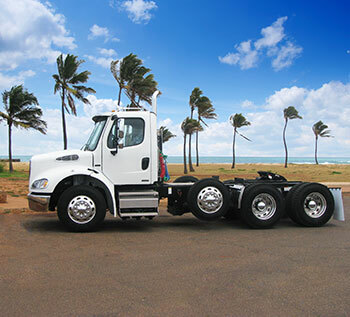 Consider our clean natural gas-powered truck, the M2 112 NG, and get even tougher on operating costs. Taper-leaf and flat-leaf front suspension capacity from 6,000 lbs. to 20,000 lbs. Meritor rear axles, capacity from 10,000 lbs. to 58,000 lbs. 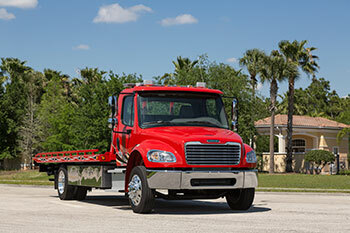 Freightliner AirLiner, TufTrac, multi-leaf, taper-leaf and flat-leaf suspensions to 52,000 lbs. Hendrickson HN/RT/RTE suspensions up to 65,000 lbs.